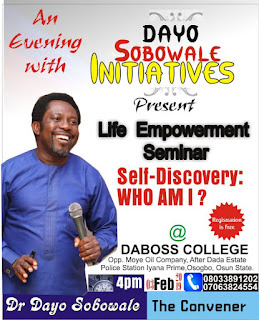 A free empowerment seminar organised by Dayo Shobowale Initiatives (DSI) will today, Sunday, February 3, 2019 hold. 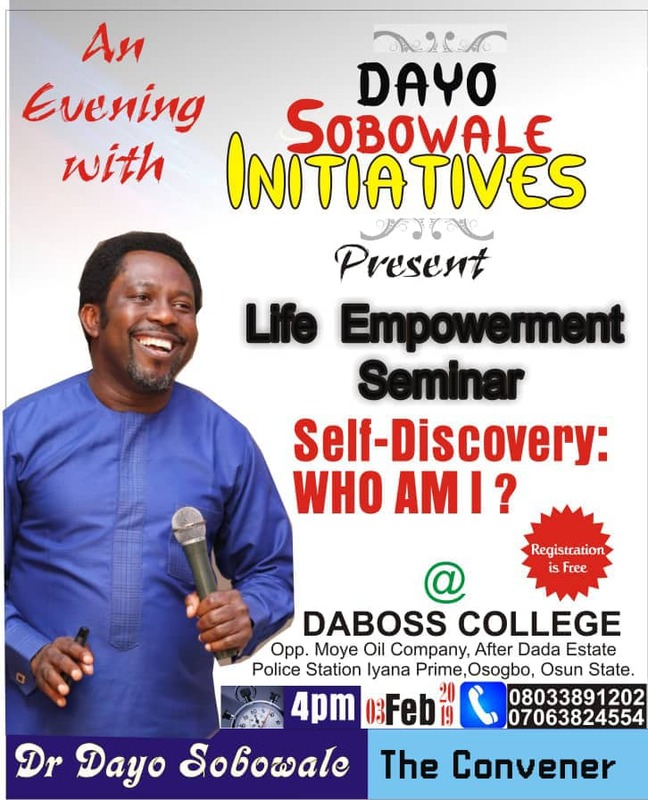 According to the convener, Dr. Dayo Shobowale, the fortnight programme would commence at 4:00pm at DABOSS COLLEGE, opposite Moye Oil, Prime Junction, after Dada Estate Police Station, Osogbo, Osun State. The convener asked those who would like to attend the seminar to send a text to 07063824554 for seat booking insisting that the registration is free. In a statement, Dr. Shobowale said, "the continuous struggling of people on earth, the difficulties faced on the journey of achieving life goals, the challenges of overcoming our own self is seldom addressed by most public speakers, preachers and counsellors. "A world of possibilities has suddenly become a world of impossibilities, a life that should be in affluence has suddenly become that of a struggle, a man that should be in control of resources has suddenly been limited to average life, worse still some could not even afford to feed, then you wonder why, why, who has done this to us. "The devil is our major excuse in Africa, we blame him for virtually everything, even when we know that we are our own enemy. We point at family members, we blame the government at all levels, Federal, state and local but we forget the two foundational governments - the family and personal governments - if those two don't change, no matter what others do, little will be their impact. "Hello friend, its time to learn how to maximize your personal and family government, then you can easily maximize your life. "This burden led to me to start a life empowerment seminar series powered by Dayo Sobowale Initiatives (DSI), which holds fortnightly, Sundays by 4pm. Tomorrow is another day for the program, the venue is at DABOSS COLLEGE, opposite Moye Oil, Prime Junction, after Dada Estate Police Station, Osogbo Osun State. Am expecting you. Thanks. Dr. Dayo Sobowale, the Convener."